Bunky starts kindergarten on Monday. I’m coming out of denial, finally. Celiac letters have been written, teachers have been contacted (and they got back to me pronto, which is promising). Her outfit – three quarter sleeve purple dress with black stars – has been selected (by her, pretty much the second she saw it at Target). She is ready. Me, not so much. But that’s okay. I’m kind of realizing that’s how it goes. Times passes, kids grow up, leaving us parents gasping for air. How did time go by so fast? Wasn’t my girl just a baby in my arms (screaming her brains out)? Oh, I hate when cliches are true. It’s annoying. When Bunky was a baby we took her to the local elementary school for an evening screening of the movie, “Yellow Submarine.” At the time the song was a huge part of our lives since we played it about seventeen (or more) times a day, often on high volume, as it was one of the only things that could stop our colicky infant from shrieking. It didn’t always work, and when it did, it was a temporary fix, but it kept us from going completely insane. I remember sitting in an audience and watching all the children skittering across the wooden floor, dancing, laughing, and talking with their friends. They looked so big. 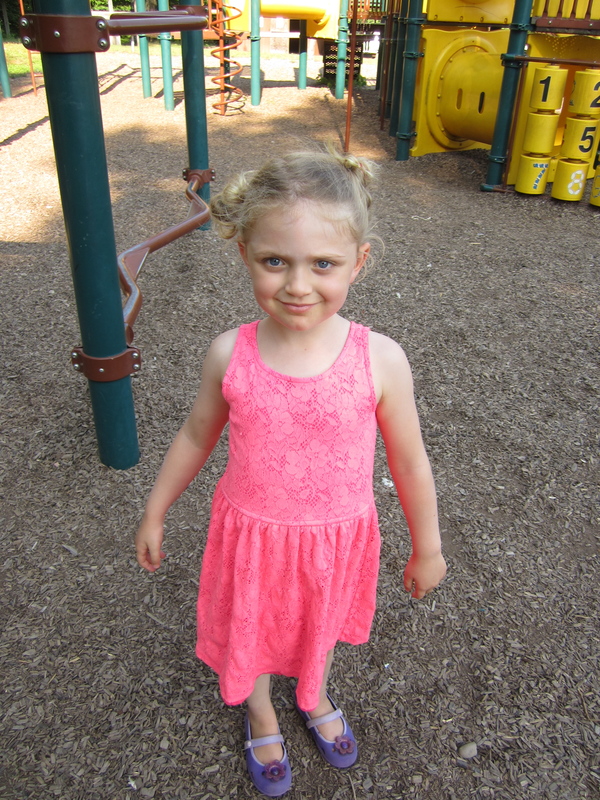 My husband and I glanced at each other over our baby’s downy head and smiled. Our girl would be going to school here, someday. But in the moment that had felt very far away. Since B has celiac, I’m on lunch and snack and holiday and birthday duty all year long. That’s a lot of food planning for a person who is not such an awesome planner. On top of all that, there’s breakfast to consider. I’ve talked about B’s addiction to Cocoa Pebbles (thanks to her dad, also an addict). Not only is it like eating a bowl full of sugar, she’s starving an hour later. Not ideal for any day, but worse for school. She does love chocolate yogurt pops, which are healthy, but not very filling. So what to do? I found two winners that are now in my freezer waiting for launch. Chocolate Chip Pumpkin muffins, modified from this awesome recipe on Cakes n’ Bakes. I skipped the cream cheese filling and added chocolate chips instead. My flour blend is about 60/40 whole grains (millet and sorghum) to starch (potato and sweet rice) and I added a teaspoon of xanthan gum. I went light on the ginger and nutmeg and added extra cinnamon. Instead of 1 cup of white sugar, I went with 1/2 cup of coconut palm sugar and 1/2 cup of white sugar. I plan on posting my modified version soon, once I completely eliminate the white sugar. I may sub all coconut sugar or try some maple syrup. Ideally, I’d like these breakfast muffins to be as healthy as possible, but with enough sweetness so my kid will eat them. It is a waste of time for me to make them uber healthy if she chokes on them. You realize I’m competing with Cocoa Pebbles here. Not easy. But possible, because she LOVES these muffins! I had to hide them in the freezer so they wouldn’t disappear by Monday. 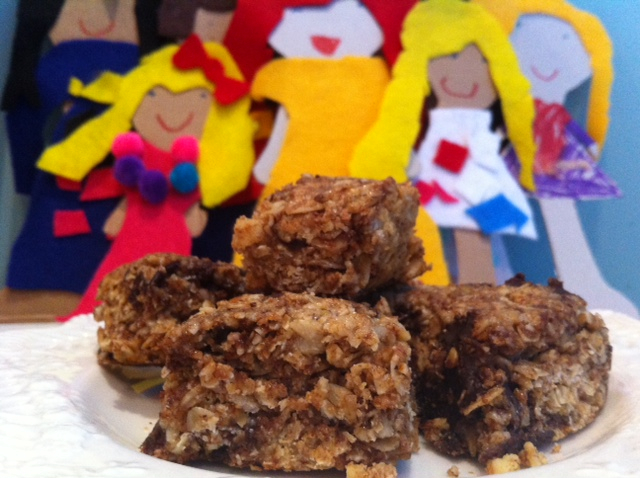 My other breakfast success, a Nicole Hunn recipe for Gluten Free Oatmeal Bars. She calls them an after school boost, but I’m going with before school. They taste way better than they look. Bunky said she liked them, but we’ll see what happens when I slide one in front of her at breakfast. I also plan on packing small squares of them in her lunch. They are delicious and full of protein and oats, yum. Very popular summer craft project around here. 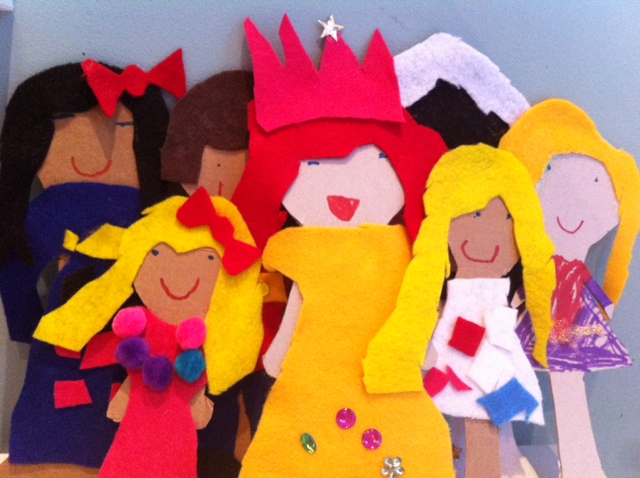 Felt pieces glued on cardboard dolls. I draw the hair and dress patterns and Bunky cuts and glues. I will miss making these with B during Little Guy’s nap. But time marches on and school is fast approaching. Yesterday was the first day it really felt like September. The sky was a crisp blue and the breeze was a perfect blend of cool-warm. We walked to the playground marveling at the perfect temperature while newly fallen leaves crunched beneath our feet. My girl was thrilled to wear one of her new school sweaters and pants. The kid loves summer, but she is ready for autumn, for apple picking and gluten free donuts, for Halloween and Little Guy’s birthday. She reminds me of my mom, whose favorite season was fall, who lived for the cooler temperatures, fall foliage, and country drives, who loved pumpkin picking and Thanksgiving. It makes sense that my mind is heavy thinking about my mom right now. It often is, but more so with this kindergarten milestone approaching. If she were alive I would be able to talk to her about releasing my girl into big kid school, we would be able to commiserate as mothers together. I could tell her that I get it now. I could thank her. But since I can’t, I will hold her close in my heart, thinking of her, imagining her doing the same thing over three decades ago, as I wave goodbye to my daughter on Monday. This entry was posted in Challenges, Family, Recipes and tagged autumn, breakfast, celiac, fall, gluten free, granola bars, healthy, kindergarten, motherhood, nostalgia, pumpkin muffins, recipes, school by Dana. Bookmark the permalink. 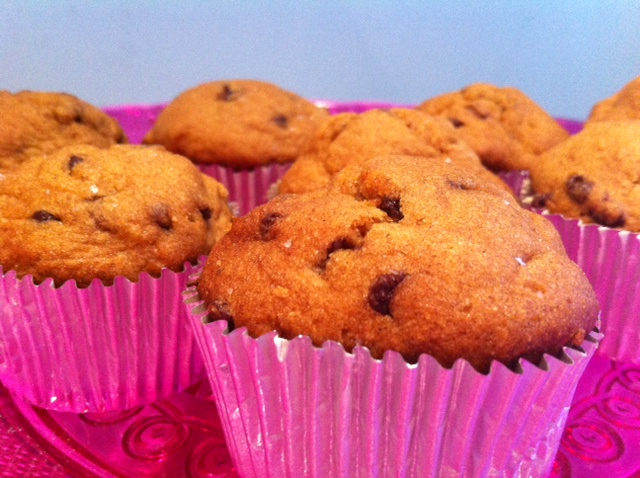 we LOVE pumpkin chocolate chip muffins over here too — our version is on my former blog @ http://ourschoolathomeblog.wordpress.com/2013/06/13/gluten-free-pumpkin-muffins/ — they’re fabulous! happy first days of school – bittersweet moments, these are. I almost cried reading this. My daughter turns 2 next month and I’m already freaking out that it as been 2 years since she was born. 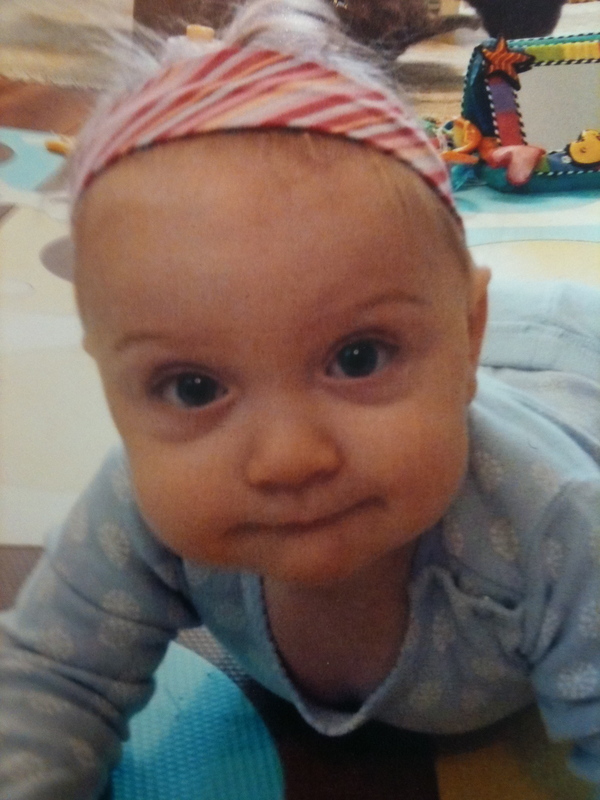 We had it very rough with her as a newborn too…cried the first several months NONSTOP. It was awful and I thought I’d die. If I could skip past the newborn stage, then I’d want another baby, but quite honestly I’m scared because it was sooo hard. I also nursed 24/7 and only got max 2 hours sleep per night. I know every baby is different though. Anyways, the muffins look delicious! Oh, Brandi, I know it! I feel like my daughter just turned 2. It’s such a vivid memory, yet, here we are over 3 years later. It’s crazy. I know what you mean about being afraid to have another… my husband and I were in a word – terrified – when we found out we were pregnant because as I’ve mentioned our girl had colic and screamed non stop for about 4 months, and then even after that, it hasn’t exactly been easy. But luckily – and it IS all about luck, as I know there are no guarantees in life – our son is VERY different. For one, he was an “easy” baby. Which was kind of mind blowing for us. He wasn’t – isn’t – an awesome sleeper (our kids just aren’t, sigh) but he was a chill baby. He could be put down (without screaming) and he nursed, but not marathon style like B. Even now, as he approaches 2, he is acting more like a toddler than a sweet easy babe, but his general disposition is milder. Thank goodness! Letting go is difficult enough without the extra concern about keeping your daughter safe from gluten. But I am sure that you have prepared her for the challenges she might face regarding food and even if you don’t think she heard you, she really has. For our teenager, we have swapped sweet breakfast cereals for a hearty savoury breakfast so that we can fill him up and get him through to 11am. Would your daughter have a toasted ham and cheese gf jaffle or gf sandwich or gf croissant for breakfast? Our son is a growing young man and I can’t get enough gluten free food in his lunch box so a big breakfast it is, with a good drink of milk or hot chocolate. My frustrating gluten free episode was letting Kieran go on a Geography 2 night excursion with a teacher whose idea of dealing with gluten free was to drop him with the other students at McDonalds and KFC for dinner, despite all the information I had given. Gluten free is never easy even when they grow up. It’s so true, letting go is hard enough, but food restrictions on top of it add to the challenge. But you’re right, we have prepared her and she IS so aware and careful. I’ve also been in touch with her teachers who have been so great and reassuring. Thanks for the breakfast ideas. My daughter doesn’t eat ham, but she does love a good grilled cheese. I need to research getting one of those jaffle makers. I wonder if the name is different in the US, but I do recall having something similar when I was a kid. But more importantly, do you actually have access to gluten free croissants, btw? If so, we’re moving to your town asap! That is very upsetting about your son’s teacher dropping the kids off for fast food, which is definitely not GF 😦 I am sure we will be having our share of those kinds of experiences. It’s inevitable, I suppose. One of our major supermarkets, Coles, stocks a product line Genius (from Edingburgh) and they have a croissant and a chocolate croissant. Expensive but so is all other gluten free food. I often think about moving to Europe or Australia, too! They seem to have it together when it comes to celiac disease in general. 🙂 How’s Bunky liking her new breakfasts so far? Europe definitely knows GF way better. I hear Italy is awesome about it, which is almost ironic, yet makes sense. B is a big fan of the muffins (already long gone) but kinda lost interest in the granola bars which is fine since I inhaled them all. Bunky is so cute! First day of school. Very special. Hope it all goes along without a hitch. Happy days. She’ll be bringing home dates soon. How did Bunky go on her first day? More importantly, how did you go? Oh you are too sweet! She did great :)) and though I was stunned and sad, I did okay too. We’ll see how day two goes, but I’m feeling hopeful! Aww! Thinking of you guys! I love Fall. And it will always remind me of our New Paltz vacay, what a treat. Here’s to the next one (whenever that may be!). Happy Kinder-ing, she’s going to love it! Can I just say, what a cute baby she was! She’s still cute, and no doubt will grow up beautiful. But her growing up is probably the last thing you want to think about just now. Thanks for sharing your thoughts, it was very moving to read! Time really does fly, it’s kind of unfair!